What is the Best Way to Take Spirulina Powder? Spirulina powder can have a disgusting taste to it and it is hard to deal with for most people. But this taste can be dealt with if you eat it the right way. So what is the best way to take spirulina powder? If you use the right ingredients it can help mask the taste of spirulina and doesn’t taste all that bad. If you get everything right it CAN actually be enjoyable. You don’t have to dread taking your spirulina anymore. There are hundreds, maybe even thousands of different recipes out there for the perfect spirulina smoothie. But pretty much all of them have a couple things in common. They use milk, fruit, and of course spirulina. Thats the BASIC spirulina smoothie guideline right there. To get you started I’ll give you a basic and commonly used recipe. This way you can start out simple and add ingredients at your own desire to bring the taste to your liking. If you want to sweeten it up add some honey, sugar, stevia, agave nectar, or even more fruit. I will say that bananas are great for spirulina smoothies. If the smoothie is too thick and you want to thin it out add more milk, water, or juice. If its too warm (you want it to be cold) add more frozen fruits or even add ice cubes. The possible combinations that you could put together to make spirulina smoothies are endless. Find what works for you. But remember, the point of you taking spirulina in the first place is for health reasons. So DON’T sacrifice health for taste. For example, don’t add a bunch of sugar when you could add stevia. Keep it healthy. It can be both good tasting and healthy at the same time. You just have to find the right recipe. There are very poor quality spirulina products out there that taste like pond scum (im guessing what that tastes like). They are grown in poor conditions and it is very noticable. 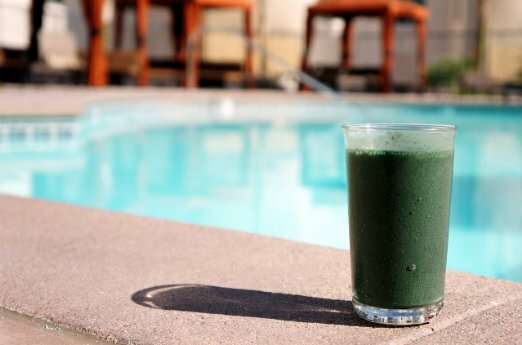 It is nearly impossible to make a good tasting smoothie with spirulina products like this. Buy a good quality spirulina product and it makes a lot of difference. The taste and smell of the powder itself will be much more bearable and it won’t clump on the sides of your cup like its trying to escape from being consumed. If you want to find some quality spirulina powder click here. These are products that I have reviewed and approve of. There you have it. I hope this helps you get started on the road to great tasting smoothies. If you have any comments or questions be sure to leave them below!